We’ve hit the middle of March and free agency is in full swing. So we are going to look at the latest moves and what is still needed come draft day. If there is one thing we know it’s that Dave Gettleman is always trying to win the war up front. So don’t be surprised if the Giants forgo shoring up at receiver and tight-end in the first round to continue building up the big-uglies. With that said, the latest G-men addition is Patrick Omameh, an OG from Jacksonville. Omameh’s signing makes it seem evident that D.J. Fluker will get the ax. The Giants also came to terms with left tackle, Nate Soldier and on the defensive front, picked up Kareem Martin, who can pull double-duty at DE or OLB. Going back over to the offensive line, the Giants put a restricted free agent tender on Brett Jones, locking in the veteran center. It looks like the Giants are well on their way to plugging holes in the O-Line. To say Gettleman has been busy is an understatement. New York just signed Teddy Williams at corner. This will give the Giants’ secondary some much-needed speed. Also from the Panthers, the Giants snagged running back Jonathan Stewart. Stewart is the all-time leading rusher for the Panthers. He is getting up there in age and probably losing a step or two, but he does fill the immediate need for a reliable running back who can move the ball. He isn’t going to be the breakout, impact guy the G-men will ultimately need. Stewart is a true veteran and professional. And I believe his presence in the locker room will be just as important as his churning power on the field. This doesn’t take Sequan Barkley off the table though. Jonathan Stewart is a band-aid. A short-term fix. I know I said not to be surprised if the Giants build up their fronts early, and they are … right now. 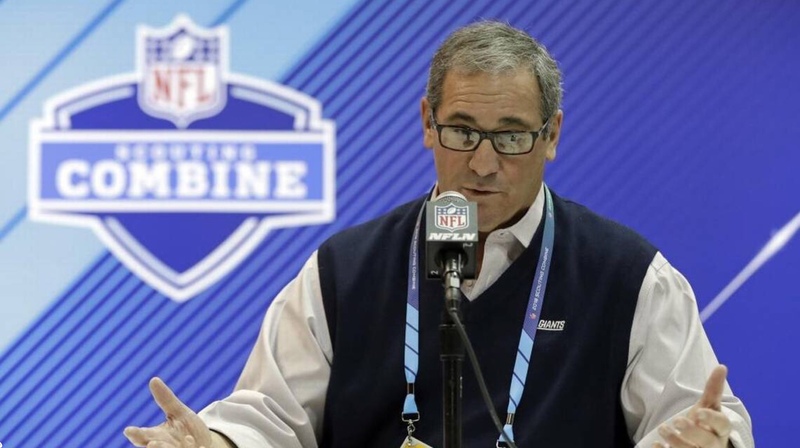 And you have to wonder if Gettleman would really pass up on a shot Quenton Nelson? It all depends on what the Browns do at #1 overall. So far, the Giants are locked in at with the #2 pick in each round through the first six rounds. They traded away their 7th-round pick to the Steelers in the Ross Crockwell deal (CB). They do need to get a replacement ready for Eli, but I think they may take a bit more of a development route and keep Eli in for at least one more season. A great option would be a 3rd or 4th-round guy like Luke Falk. If you are are playing under Mike Leach, there is one thing you have to be able to do well and that’s pass the ball. He doesn’t have the best arm strength, but he does have a quick release and in-pocket great mobility. 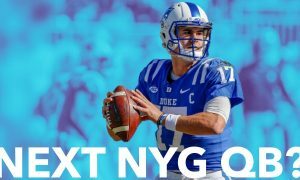 In a league that is moving ever more towards dual-threat QBs, Falk may get overlooked for a couple of rounds and the Giants might be able to score a guy who fits perfectly into their system for a really good price. If the Browns pass on Sequan Barkley, and the Giants do take him, it will be to finagle a slew of trades. However, I have a feeling the Giants take Nelson and their second-round pick will be the running back they need; Ronald Jones out of USC. He’s an all-around back that isn’t afraid to pick up pass blocks and can catch the ball as well. One thing is sure, the 2018 Giants will be much better equipped than the 2017 team. When we check the betting odds at Heritage Sports, the NY Giants come in at +6000 (60 to 1) to win the Super Bowl in 2018, so Vegas and online outlets are factoring in the rebuild, but it will be interesting to see if these odds reduce a bit after all the new factors are in place.